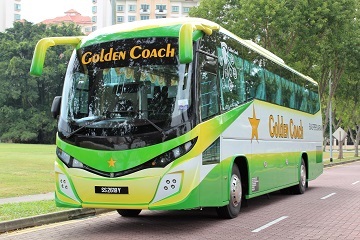 Golden Coach Express is a well-established bus company which offers services from Singapore to Malaysia. 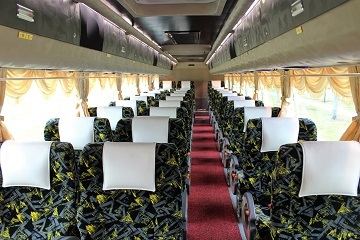 Although the company is a considered a newcomer to the bus industry in Singapore, they actually have one decade of golden knowledge providing express bus services in Malaysia. Since almost everything is done through the internet these days, booking a bus ticket online through Easybook is definitely in the list as well. The headquarter is currently located at Concorde Shopping Centre, which is a strategic location for Golden Coach Express to locate as it is near to the Tiong Bahru MRT Station (CC27), Outram Park MRT Station (EW16/NE3) and Chinatown MRT Station (NE4). Passengers can easily get to Concorde Shopping Centre to board the bus by taking the MRT. There are also several bus stops located opposite Holiday Inn Atrium, at Holiday inn Atrium and Blk 94, Zion Road. For the conveniences of customers who are working and living within the East areas of Singapore, they have established a branch at City Plaza which is just within 5 minutes walking distance from Paya Lebar MRT Station (both Circle Line and East West Line). The headquarter and the branch are the top pick-up points for their bus services as they are located nearby other terminals of public transport where passengers can get to easily. 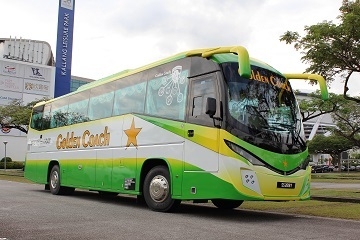 Golden Coach Express provides long distance express bus service from Singapore to Malaysia with a wide range of routes to various parts of Peninsular Malaysia namely Melaka, Kuala Lumpur, Seremban, Ipoh and many more. On top of that, they are the only express bus operator that offer express bus service from Singapore to Kuala Lumpur International Airport (KLIA) and KLIA2, which are the most popular routes offered by the operator. Golden Coach Express operates at various bus terminals across Peninsular Malaysia and Singapore such as Terminal Bersepadu Selatan (TBS) and Tun Aminah in Malaysia, as well as Concorde Shopping Centre in Singapore and more! The seats of their bus coaches are designed in a 2+1 seating arrangement. To provide their passengers a pleasurable and enjoyable journey, all the coaches are equipped with air-conditioning system. In additions, spacious leg rooms are available for every single seat on the buses to enhance the comfortability of the seats. The reclining seats on the buses allow passengers to take great naps during their journeys, so that passengers can be re-energized before they kick start their trip to their preferable destination. Save the hassle of flying into Kuala Lumpur, then getting on a bus to Port Dickson when you can just hop on Golden Coach Singapore to take you directly to one of the five exciting drop-off points? Start planning a trip with Golden Coach bus for the entire family now and we will help to save you the trouble of queuing up by purchasing your bus tickets online with Easybook right now. 317 Outram Road #01-13 Concorde Shopping Centre Singapore 169075. * Hanya 0.01% harga perjalanan yang tinggi sedikit daripada kaunter ** Hanya boleh digunakan untuk transaksi tanpa menggunakan kod diskaun dan perjalanan yang ditawarkan oleh syarikat-syarikat tertentu. *** Untuk perjalanan yang tertentu sahaja, diskaun telah dimasuk dalam harga tiket (harga lebih rendah daripada kaunter bas). * Gambar Bas adalah untuk rujukan sahaja. * Masa perjalanan hanya jangkaan masa sahaja.